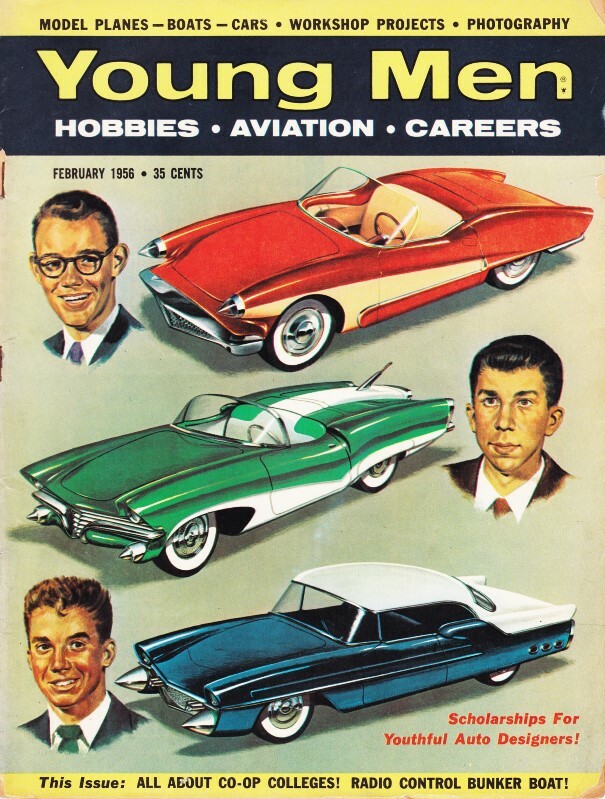 Bell Aircraft Company is probably most famous for the X-1 supersonic airplane, piloted by Chuck Yeager. The P-39 Airacobra likely is the runner up. 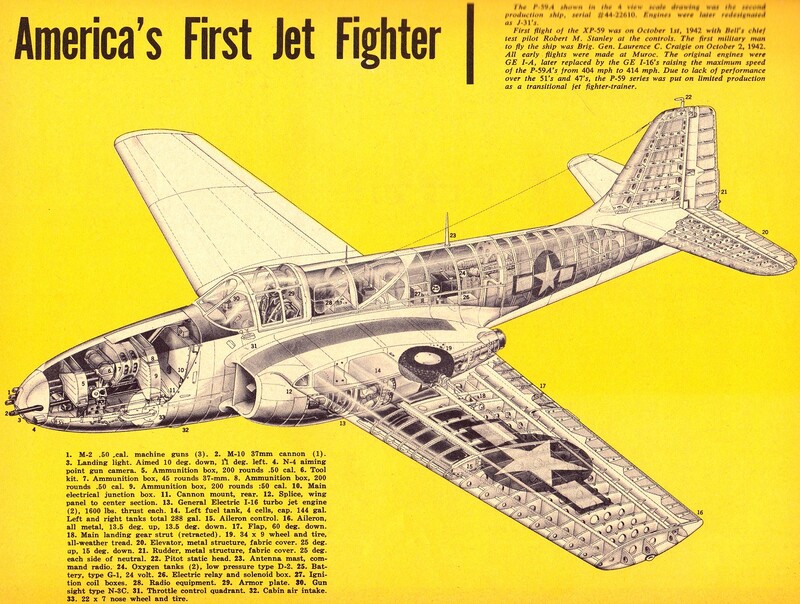 Their P-59 Airacomet is a less-known because it was never used in combat, but it is billed as America's first production jet aircraft. 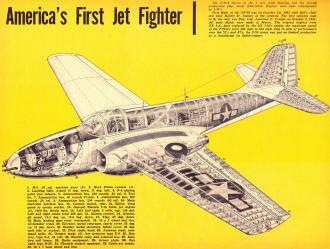 Its maiden flight was in 1942, at the beginning of World War II. During flight testing, its nature was disguised by placing a faux propeller on the nose, underneath a cloaking tarpaulin. Thanks to Bob Balsie for scanning the pages. 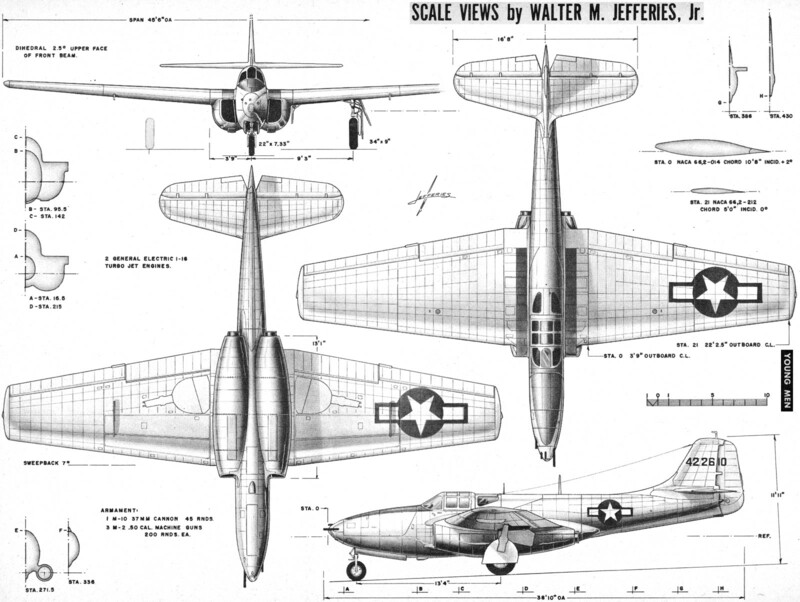 The P-59-A shown in the A view scale drawing was the second production ship, serial #44-22610. Engines later redesigned as J-31's. 1. M-2 .50 cal. machine guns (3). 2. M-10 37mm cannon (1). 3. Landing light. Aimed 10 deg. down, 11 deg. left. 4. N-4 aiming point gun camera. 5. Ammunition box, 200 rounds .50 cal, 6. Tool kit. 7. Ammunition box, 45 rounds 37-mm. 8. Ammunition box, 200 rounds .50 cal. 9. Ammunition box, 200 rounds .50 cal. 10. Main electrical junction box. 11. Cannon mount, rear. 12. Splice, wing panel to center section. 13. General Electric I-16 turbo jet engine (2), 1600 lbs. thrust each. 14. Left fuel tank, 4 cells, cap. 144 gal. Left and right tanks total 288 gal. 15. Aileron control. 16. Aileron, all metal, 13.5 deg. up, 13.5 deg. down. 17. Flap, 60 deg. down. 18. Main landing gear strut (retracted). 19. 34 x 9 wheel and tire, all-weather tread. 20. Elevator, metal structure, fabric cover. 25 deg. up, 15 deg. down. 21. Rudder, metal structure, fabric cover. 25 deg. each side of neutral. 22. Pitot static head. 23. Antenna mast, command radio. 24. Oxygen tanks (2), low pressure type D-2. 25. Battery, type G-1, 24 volt. 26. Electric relay and solenoid box. 27. Ignition coil boxes. 28. Radio equipment. 29. Armor plate. 30. Gun sight type N-3C. 31. Throttle control quadrant. 32. Cabin air intake. 33. 22 x 7 nose wheel and tire. First flight of the XP-59 was on October 1st, 1942 with Bell's chief test pilot Robert M. Stanley at the controls. The first military man to fly the ship was Brig. Gen. Laurence C. Craigie on October 2, 1942. All early flights were made at Muroc. 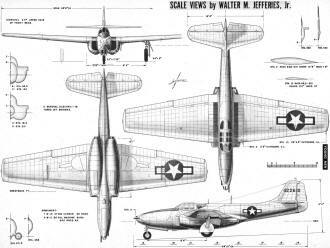 The original engines were GE I-A, later replaced by the GE I-16's raising the maximum speed of the P-59A's from 404 mph to 414 mph. Due to lack of performance over the 51's and 47's, the P-59 series was put on limited production as a transitional jet fighter-trainer.